"The Balloon-Hoax" was Edgar Allan Poe's attempt to pull off a hoax similar to the Great Moon Hoax of 1835, in part due to his belief that the moon hoax had borrowed too liberally from his own Hans Pfaall story. Some believed the events chronicled below when the story ran in the New York Sun, the same paper that launched the moon hoax. The paper later retracted the story with these words: "BALLOON - The mails from the South last Saturday night not having brought a confirmation of the arrival of the Balloon from England, the particulars of which from our correspondent we detailed in our Extra, we are inclined to believe that the intelligence is erroneous. The description of the Balloon and the voyage was written with a minuteness and scientific ability calculated to obtain credit everywhere, and was read with great pleasure and satisfaction. We by no means think such a project impossible." [Astounding News by Express, via Norfolk!—The Atlantic crossed in Three Days! Signal Triumph of Mr. Monck Mason's Flying Machine!— Arrival at Sullivan's Island, near Charleston, S.C., of Mr. Mason, Mr. Robert Holland, Mr. Henson, Mr. Harrison Ainsworth, and four others, in the Steering Balloon, "Victoria," after a passage of Seventy-five Hours from Land to Land! Full Particulars of the Voyage! The great problem is at length solved! The air, as well as the earth and the ocean, has been subdued by science, and will become a common and convenient highway for mankind. The Atlantic has been actually crossed in a Balloon! and this too without difficulty—without any great apparent danger—with thorough control of the machine—and in the inconceivably brief period of seventy-five hours from shore to shore! By the energy of an agent at Charleston, S.C., we are enabled to be the first to furnish the public with a detailed account of this most extraordinary voyage, which was performed between Saturday, the 6th instant, at 11, A.M., and 2, P.M., on Tuesday, the 9th instant, by Sir Everard Bringhurst; Mr. Osborne, a nephew of Lord Bentinck's; Mr. Monck Mason and Mr. Robert Holland, the well-known æronauts; Mr. Harrison Ainsworth, author of "Jack Sheppard," &c.; and Mr. Henson, the projector of the late unsuccessful flying machine—with two seamen from Woolwich—in all, eight persons. The particulars furnished below may be relied on as authentic and accurate in every respect, as, with a slight exception, they are copied verbatim from the joint diaries of Mr. Monck Mason and Mr. Harrison Ainsworth, to whose politeness our agent is also indebted for much verbal information respecting the balloon itself, its construction, and other matters of interest. The only alteration in the MS. received, has been made for the purpose of throwing the hurried account of our agent, Mr. Forsyth, in a connected and intelligible form. Two very decided failures, of late—those of Mr. Henson and Sir George Cayley—had much weakened the public interest in the subject of aerial navigation. Mr. Henson's scheme (which at first was considered very feasible even by men of science,) was founded upon the principle of an inclined plane, started from an eminence by an extrinsic force, applied and continued by the revolution of impinging vanes, in form and number resembling the vanes of a windmill. But, in all the experiments made with models at the Adelaide Gallery, it was found that the operation of these fans not only did not propel the machine, but actually impeded its flight. The only propelling force it ever exhibited, was the mere impetus acquired from the descent of the inclined plane; and this impetus carried the machine farther when the vanes were at rest, than when they were in motion—a fact which sufficiently demonstrates their inutility; and in the absence of the propelling, which was also the sustaining power, the whole fabric would necessarily descend. This consideration led Sir George Cayley to think only of adapting a propeller to some machine having of itself an independent power of support—in a word, to a balloon; the idea, however, being novel, or original, with Sir George, only so far as regards the mode of its application to practice. He exhibited a model of his invention at the Polytechnic Institution. The propelling principle, or power, was here, also, applied to interrupted surfaces, or vanes, put in revolution. These vanes were four in number, but were found entirely ineffectual in moving the balloon, or in aiding its ascending power. The whole project was thus a complete failure. It was at this juncture that Mr. Monck Mason (whose voyage from Dover to Weilburg in the balloon, "Nassau," occasioned so much excitement in 1837,) conceived the idea of employing the principle of the Archimedean screw for the purpose of propulsion through the air—rightly attributing the failure of Mr. Henson's scheme, and of Sir George Cayley's, to the interruption of surface in the independent vanes. He made the first public experiment at Willis's Rooms, but afterwards removed his model to the Adelaide Gallery. Like Sir George Cayley's balloon, his own was an ellipsoid. Its length was thirteen feet six inches—height, six feet eight inches. It contained about three hundred and twenty cubic feet of gas, which, if pure hydrogen, would support twenty-one pounds upon its first inflation, before the gas has time to deteriorate or escape. The weight of the whole machine and apparatus was seventeen pounds—leaving about four pounds to spare. 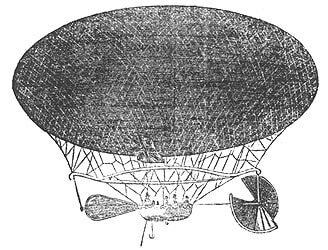 Beneath the centre of the balloon, was a frame of light wood, about nine feet long, and rigged on to the balloon itself with a network in the customary manner. From this framework was suspended a wicker basket or car. The screw consists of an axis of hollow brass tube, eighteen inches in length, through which, upon a semi-spiral inclined at fifteen degrees, pass a series of a steel wire radii, two feet long, and thus projecting a foot on either side. These radii are connected at the outer extremities by two bands of flattened wire—the whole in this manner forming the framework of the screw, which is completed by a covering of oiled silk cut into gores, and tightened so as to present a tolerably uniform surface. At each end of its axis this screw is supported by pillars of hollow brass tube descending from the hoop. In the lower ends of these tubes are holes in which the pivots of the axis revolve. From the end of the axis which is next the car, proceeds a shaft of steel, connecting the screw with the pinion of a piece of spring machinery fixed in the car. By the operation of this spring, the screw is made to revolve with great rapidity, communicating a progressive motion to the whole. By means of the rudder, the machine was readily turned in any direction. The spring was of great power, compared with its dimensions, being capable of raising forty-five pounds upon a barrel of four inches diameter, after the first turn, and gradually increasing as it was wound up. It weighed, altogether, eight pounds six ounces. The rudder was a light frame of cane covered with silk, shaped somewhat like a battledoor, and was about three feet long, and at the widest, one foot. Its weight was about two ounces. It could be turned flat, and directed upwards or downwards, as well as to the right or left; and thus enabled the æronaut to transfer the resistance of the air which in an inclined position it must generate in its passage, to any side upon which he might desire to act; thus determining the balloon in the opposite direction. This model (which, through want of time, we have necessarily described in an imperfect manner,) was put in action at the Adelaide Gallery, where it accomplished a velocity of five miles per hour; although, strange to say, it excited very little interest in comparison with the previous complex machine of Mr. Henson—so resolute is the world to despise anything which carries with it an air of simplicity. To accomplish the great desideratum of æerial navigation, it was very generally supposed that some exceedingly complicated application must be made of some unusually profound principle in dynamics. So well satisfied, however, was Mr. Mason of the ultimate success of his invention, that he determined to construct immediately, if possible, a balloon of sufficient capacity to test the question by a voyage of some extent—the original design being to cross the British Channel, as before, in the Nassau balloon. To carry out his views, he solicited and obtained the patronage of Sir Everard Bringhurst and Mr. Osborne, two gentlemen well known for scientific acquirement, and especially for the interest they have exhibited in the progress of ærostation. The project, at the desire of Mr. Osborne, was kept a profound secret from the public—the only persons entrusted with the design being those actually engaged in the construction of the machine, which was built (under the superintendence of Mr. Mason, Mr. Holland, Sir Everard Bringhurst, and Mr. Osborne,) at the seat of the latter gentleman near Penstruthal, in Wales. Mr. Henson, accompanied by his friend Mr. Ainsworth, was admitted to a private view of the balloon, on Saturday last—when the two gentlemen made final arrangements to be included in the adventure. We are not informed for what reason the two seamen were also included in the party—but, in the course of a day or two, we shall put our readers in possession of the minutest particulars respecting this extraordinary voyage. For its introduction into common use for purposes of aerostation, we are indebted to Mr. Charles Green. Up to his discovery, the process of inflation was not only exceedingly expensive, but uncertain. Two, and even three days, have frequently been wasted in futile attempts to procure a sufficiency of hydrogen to fill a balloon, from which it had great tendency to escape owing to its extreme subtlety, and its affinity for the surrounding atmosphere. In a balloon sufficiently perfect to retain its contents of coal-gas unaltered, in quality or amount, for six months, an equal quantity of hydrogen could not be maintained in equal purity for six weeks. The supporting power being estimated at 2500 pounds, and the united weights of the party amounting only to about 1200, there was left a surplus of 1300, of which again 1200 was exhausted by ballast, arranged in bags of different sizes, with their respective weights marked upon them—by cordage, barometers, telescopes, barrels containing provision for a fortnight, water-casks, cloaks, carpet-bags, and various other indispensable matters, including a coffee-warmer, contrived for warming coffee by means of slack-lime, so as to dispense altogether with fire, if it should be judged prudent to do so. All these articles, with the exception of the ballast, and a few trifles, were suspended from the hoop over head. The car is much smaller and lighter, in proportion, than the one appended to the model. It is formed of a light wicker, and is wonderfully strong, for so frail looking a machine. Its rim is about four feet deep. The rudder is also very much larger, in proportion, than that of the model; and the screw is considerably smaller. The balloon is furnished besides, with a grapnel, and a guide-rope; which latter is of the most indispensable importance. A few words, in explanation, will here be necessary for such of our readers as are not conversant with the details of aerostation. As soon as the balloon quits the earth, it is subjected to the influence of many circumstances tending to create a difference in its weight; augmenting or dimishing its ascending power. For example, there may be a disposition of dew upon the silk, to the extent, even, of several hundred pounds; ballast has then to be thrown out, or the machine may descend. This ballast being discarded, and a clear sunshine evaporating the dew, and at the same time expanding the gas in the silk, the whole will again rapidly ascend. To check this ascent, the only resource is, (or rather was, until Mr. Green's invention of the guide-rope,) the permission of the escape of gas from the valve; but, in the loss of gas, is a proportionate general loss of ascending power; so that, in a comparatively brief period, the best constructed balloon must necessarily exhaust all its resources, and come to the earth. This was the great obstacle to voyages of length. The guide-rope remedies the difficulty in the simplest manner conceivable. It is merely a very long rope which is suffered to trail from the car, and the effect of which is to prevent the balloon from changing its level in any material degree. If, for example, there should be a deposition of moisture upon the silk, and the machine begins to descend in consequence, there will be no neccesity for discharging ballast to remedy the increase of weight, for it is remedied, or counteracted, in an exactly just proportion, by the deposit on the ground of just so much of the end of the rope as is necessary. If, on the other hand, any circumstances should cause undue levity, and consequent ascent, this levity is immediately counteracted by the additional weight of rope upraised from the earth. Thus, the balloon can neither ascend or descend, except within very narrow limits, and its resources, either in gas or ballast, remain comparatively unimpaired. When passing over an expanse of water, it becomes necessary to employ small kegs of copper or wood, filled with liquid ballast of a lighter nature than water. These float, and serve all the purposes of a mere rope on land. Another most important office of the guide-rope, is to point out the direction of the balloon. The rope drags, either on land or sea, while the balloon is free; the latter, consequently, is always in advance, when any progress whatever is made: a comparison, therefore, by means of the compass, of the relative positions of the two objects, will always indicate the course. In the same way, the angle formed by the rope with the vertical axis of the machine, indicates the velocity. When there is no angle—in other words, when the rope hangs perpendicularly, the whole apparatus is stationary; but the larger the angle, that is to say, the farther the balloon precedes the end of the rope, the greater the velocity; and the converse. As the original design was to cross the British Channel, and alight as near Paris as possible, the voyagers had taken the precaution to prepare themselves with passports directed to all parts of the Continent, specifying the nature of the expedition, as in the case of the Nassau voyage, and entitling the adventurers to exemption from the usual formalities of office: unexpected events, however, rendered these passports superfluous. The inflation was commenced very quietly at daybreak, on Saturday morning, the 6th instant, in the Court-Yard of Weal-Vor House, Mr. Osborne's seat, about a mile from Penstruthal, in North Wales; and at 7 minutes past 11, every thing being ready for departure, the balloon was set free, rising gently but steadily, in a direction nearly South; no use being made, for the first half hour, of either the screw or the rudder. We proceed now with the journal, as transcribed by Mr. Forsyth from the joint MSS. of Mr. Monck Mason, and Mr. Ainsworth. The body of the journal, as given, is in the hand-writing of Mr. Mason, and a P.S. is appended, each day, by Mr. Ainsworth, who has in preparation, and will shortly give the public a more minute, and no doubt, a thrillingly interesting account of the voyage. Saturday, April the 6th.—Every preparation likely to embarrass us, having been made over night, we commenced the inflation this morning at daybreak; but owing to a thick fog, which encumbered the folds of the silk and rendered it unmanageable, we did not get through before nearly eleven o'clock. Cut loose, then, in high spirits, and rose gently but steadily, with a light breeze at North, which bore us in the direction of the British Channel. Found the ascending force greater than we had expected; and as we arose higher and so got clear of the cliffs, and more in the sun's rays, our ascent became very rapid. I did not wish, however, to lose gas at so early a period of the adventure, and so concluded to ascend for the present. We soon ran out our guide-rope; but even when we had raised it clear of the earth, we still went up very rapidly. The balloon was unusually steady, and looked beautifully. In about ten minutes after starting, the barometer indicated an altitude of 15,000 feet. The weather was remarkably fine, and the view of the subjacent country—a most romantic one when seen from any point,—was now especially sublime. The numerous deep gorges presented the appearance of lakes, on account of the dense vapors with which they were filled, and the pinnacles and crags to the South East, piled in inextricable confusion, resembled nothing so much as the giant cities of eastern fable. We were rapidly approaching the mountains in the South; but our elevation was more than sufficient to enable us to pass them in safety. In a few minutes we soared over them in fine style; and Mr. Ainsworth, with the seamen, were surprised at their apparent want of altitude when viewed from the car, the tendency of great elevation in a balloon being to reduce inequalities of the surface below, to nearly a dead level. At half-past eleven still proceeding nearly South, we obtained our first view of the Bristol Channel; and, in fifteen minutes afterwards, the line of breakers on the coast appeared immediately beneath us, and we were fairly out at sea. We now resolved to let off enough gas to bring our guide-rope, with the buoys affixed, into the water. This was immediately done, and we commenced a gradual descent. In about twenty minutes our first buoy dipped, and at the touch of the second soon afterwards, we remained stationary as to elevation. We were all now anxious to test the efficiency of the rudder and screw, and we put them both into requisition forthwith, for the purpose of altering our direction more to the eastward, and in a line for Paris. By means of the rudder we instantly effected the necessary change of direction, and our course was brought nearly at right angles to that of the wind; when we set in motion the spring of the screw, and were rejoiced to find it propel us readily as desired. Upon this we gave nine hearty cheers, and dropped in the sea a bottle, enclosing a slip of parchment with a brief account of the principle of the invention. Hardly, however, had we done with our rejoicings, when an unforeseen accident occurred which discouraged us in no little degree. The steel rod connecting the spring with the propeller was suddenly jerked out of place, at the car end, (by a swaying of the car through some movement of one of the two seamen we had taken up,) and in an instant hung dangling out of reach, from the pivot of the axis of the screw. While we were endeavoring to regain it, our attention being completely absorbed, we became involved in a strong current of wind from the East, which bore us, with rapidly increasing force, towards the Atlantic. We soon found ourselves driving out to sea at the rate of not less, certainly, than fifty or sixty miles an hour, so that we came up with Cape Clear, at some forty miles to our North, before we had secured the rod, and had time to think what we were about. It was now that Mr. Ainsworth made an extraordinary, but to my fancy, a by no means unreasonable or chimerical proposition, in which he was instantly seconded by Mr. Holland—viz. : that we should take advantage of the strong gale which bore us on, and in place of beating back to Paris, make an attempt to reach the coast of North America. After slight reflection I gave a willing assent to this bold proposition, which (strange to say) met with objection from the two seamen only. As the stronger party, however, we over-ruled their fears, and kept resolutely upon our course. We steered due West; but as the trailing of the buoys materially impeded our progress, and we had the balloon abundantly at command, either for ascent or descent, we first threw out fifty pounds of ballast, and then wound up (by means of a windlass) so much of a rope as brought it quite clear of the sea. We perceived the effect of this manœuvre immediately, in a vastly increased rate of progress; and, as the gale freshened, we flew with a velocity nearly inconceivable; the guide-rope flying out behind the car, like a streamer from a vessel. It is needless to say that a very short time sufficed us to lose sight of the coast. We passed over innumerable vessels of all kinds, a few of which were endeavoring to beat up, but the most of them lying to. We occasioned the greatest excitement on board all—an excitement greatly relished by ourselves, and especially by our two men, who, now under the influence of a dram of Geneva, seemed resolved to give all scruple, or fear, to the wind. Many of the vessels fired signal guns; and in all we were saluted with loud cheers (which we heard with surprising distinctness) and the waving of caps and handkerchiefs. We kept on in this manner throughout the day, with no material incident, and, as the shades of night closed around us, we made a rough estimate of the distance traversed. It could not have been less than five hundred miles, and was probably much more. The propeller was kept in constant operation, and, no doubt, aided our progress materially. As the sun went down, the gale freshened into an absolute hurricane, and the ocean beneath was clearly visible on account of its phosphorescence. The wind was from the East all night, and gave us the brightest omen of success. We suffered no little from cold, and the dampness of the atmosphere was most unpleasant; but the ample space in the car enabled us to lie down, and by means of cloaks and a few blankets, we did sufficiently well. P.S. (by Mr. Ainsworth). The last nine hours have been unquestionably the most exciting of my life. I can conceive nothing more sublimating than the strange peril and novelty of an adventure such as this. May God grant that we succeed! I ask not success for mere safety to my insignificant person, but for the sake of human knowledge and—for the vastness of the triumph. And yet the feat is only so evidently feasible that the sole wonder is why men have scrupled to attempt it before. One single gale such as now befriends us—let such a tempest whirl forward a balloon for four or five days (these gales often last longer) and the voyager will be easily borne, in that period, from coast to coast. In view of such a gale the broad Atlantic becomes a mere lake. I am more struck, just now, with the supreme silence which reigns in the sea beneath us, notwithstanding its agitation, than with any other phenomenon presenting itself. The waters give up no voice to the heavens. The immense flaming ocean writhes and is tortured uncomplainingly. The mountainous surges suggest the idea of innumerable dumb gigantic fiends struggling in impotent agony. In a night such as is this to me, a man lives—lives a whole century of ordinary life—nor would I forego this rapturous delight for that of a whole century of ordinary existence. Sunday, the seventh. [Mr. Mason's MS.] This morning the gale, by 10, had subsided to an eight or nine knot breeze, (for a vessel at sea,) and bears us, perhaps, thirty miles per hour, or more. It has veered however, very considerably to the north; and now, at sundown, we are holding our course due west, principally by the screw and rudder, which answer their purposes to admiration. I regard the project as thoroughly successful, and the easy navigation of the air in any direction (not exactly in the teeth of a gale) as no longer problematical. We could not have made head against the strong wind of yesterday; but, by ascending, we might have got out of its influence, if requisite. Against a pretty stiff breeze, I feel convinced, we can make our way with the propeller. At noon, to-day, ascended to an elevation of nearly 25,000 feet, by discharging ballast. Did this to search for a more direct current, but found none so favorable as the one we are now in. We have an abundance of gas to take us across this small pond, even should the voyage last three weeks. I have not the slightest fear for the result. The difficulty has been strangely exaggerated and misapprehended. I can choose my current, and should I find all currents against me, I can make very tolerable headway with the propeller. We have had no incidents worth recording. The night promises fair. P.S. [By Mr. Ainsworth.] I have little to record, except the fact (to me quite a surprising one) that, at an elevation equal to that of Cotopaxi, I experienced neither very intense cold, nor headache, nor difficulty of breathing; neither, I find, did Mr. Mason, nor Mr. Holland, nor Sir Everard. Mr. Osborne complained of constriction of the chest—but this soon wore off. We have flown at a great rate during the day, and we must be more than half way across the Atlantic. We have passed over some twenty or thirty vessels of various kinds, and all seem to be delightfully astonished. Crossing the ocean in a balloon is not so difficult a feat after all. Omne ignotum pro magnifico. Mem: at 25,000 feet elevation the sky appears nearly black, and the stars are distinctly visible; while the sea does not seem convex (as one might suppose) but absolutely and most unequivocally concave. Monday, the 8th. [Mr. Mason's MS.] This morning we had again some little trouble with the rod of the propeller, which must be entirely remodelled, for fear of serious accident—I mean the steel rod—not the vanes. The latter could not be improved. The wind has been blowing steadily and strongly from the north-east all day; and so far fortune seems bent upon favoring us. Just before day, we were all somewhat alarmed at some odd noises and concussions in the balloon, accompanied with the apparent rapid subsidence of the whole machine. These phenomena were occasioned by the expansion of the gas, through increase of heat in the atmosphere, and the consequent disruption of the minute particles of ice with which the network had become encrusted during the night. Threw down several bottles to the vessels below. Saw one of them picked up by a large ship—seemingly one of the New York line packets. Endeavored to make out her name, but could not be sure of it. Mr. Osborne's telescope made it out something like "Atalanta." It is now 12, at night, and we are still going nearly west, at a rapid pace. The sea is peculiarly phosphorescent. P.S. [By Mr. Ainsworth.] It is now 2, a. m., and nearly calm, as well as I can judge—but it is very difficult to determine this point, since we move with the air so completely. I have not slept since quitting Wheal-Vor, but can stand it no longer, and must take a nap. We cannot be far from the American coast. Tuesday, the 9th. [Mr. Ainsworth's M. S.] One, P.M. We are in full view of the low coast of South Carolina. The great problem is accomplished. We have crossead the Atlantic—fairly and easily crossed it in a balloon! God be praised! Who shall say that anything is impossible hereafter? The Journal here ceases. Some particulars of the descent were communicated, however, by Mr. Ainsworth to Mr. Forsyth. It was nearly dead calm when the voyagers first came in view of the coast, which was immediately recognised by both the seamen, and by Mr. Osborne. The latter gentleman having acquaintances at Fort Moultrie, it was immediately resolved to descend in its vicinity. The balloon was brought over the beach (the tide being out and the sand hard, smooth, and admirably adapted for a descent,) and the grapnel let go, which took firm hold at once. The inhabitants of the island, and of the fort, thronged out, of course, to see the balloon; but it was with the greatest difficulty that any one could be made to credit the actual voyage--the crossing of the Atlantic. The grapnel caught at 2, P.M., precisely; and thus the whole voyage was completed in seventy-five hours; or rather less, counting from shore to shore. No serious accident occurred. No real danger was at any time apprehended. The balloon was exhausted and secured without trouble; and when the MS. from which this narrative is compiled was despatched from Charleston, the party were still at Fort Moultrie. Their farther intentions were not ascertained; but we can safely promise our readers some additional information either on Monday or in the course of the next day, at farthest. Note.—Mr. Ainsworth has not attempted to account for this phenomena, which, however, is quite susceptible of explanation. A line dropped from an elevation of 25,000 feet, perpendicularly to the surface of the earth (or sea), would form the perpendicular of a right-angled triangle, of which the base would extend from the right angle to the horizon, and the hypothenuse from the horizon to the balloon. But the 25,000 feet of altitude is little or nothing, in comparison with the extent of the prospect. In other words, the base and hypothenuse of the supposed triangle would be so long when compared with the perpendicular, that the two former may be regarded as nearly parallel. In this manner the horizon of the æronaut would appear to be on a level with the car. But, as the point immediately beneath him seems, and is, at a great distance below him, it seems, of course, also, at a great distance below the horizon. Hence the impression of concavity; and this impression must remain, until he elevation shall bear so great a proportion to the extent of prospect, that the apparet parallelism of the base and hypothenuse disappears—when the earth's real convexity must become apparent.